Grand Hotel & Apartments "Oasis" was designed and constructed for the sole purpose to be an oasis of comfort and pleasure in the heart of Sunny Beach. 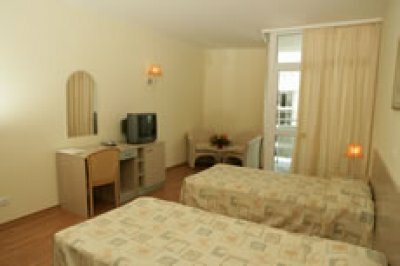 It offers 62 double rooms, 2 hotel suites, 80 units of 1-bedroom apartments and 8 studios. 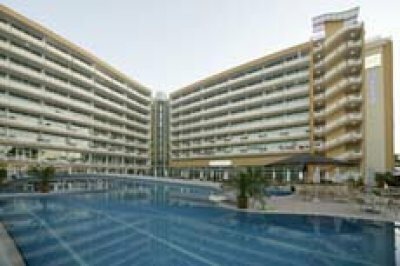 The complex is located in the modern central part of the resort near shops, restaurants and clubs and only 80 m away from the beach. I've been visiting the hotel for one week, with my sis and bro and my parents! we really enjoyed our accomodation there! the service is good! the persons on the reception are very nice and kind! the rooms are very clean, the food (brakfast) isn't bad , but it can be better! the pool is cold, but it's ok... the hotel is near the souk, and the supermarket, so it's very nice! the ambiance is really amazing, especially the pool bar!! my advice to u (reader) : visit it! u will enjoy it!!! Lovely hotel, clean and friendly. Excellant pool and although in a lively resort quiet at night within the hotel areas. Loads to do and see around, our children loved it as did we. It is a tourist holiday resort and therefore has all the trappings as such but found the area to be safe and welcoming, without being constantly hastled to buy things.Definately worth a visit! Just returned from two weeks at this hotel. I must say that the hotel is first class, excellent furnishings and clean. Also the pool is lovely and one of the largest in Sunny Beach. Had heard that the pool was cold but did not really find this. The only down side was that you completely lost the sun around the pool mid afternoon and then the pool could feel quite cool. On the whole the resort of Sunny Beach not to my liking - very cheap and tacky. Food very disappointing to say the least. 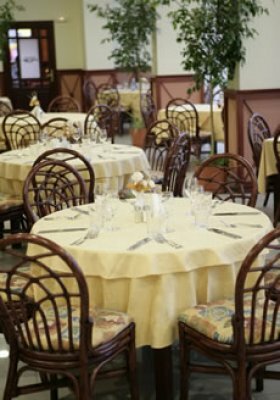 However, can recommend the Venice Restaurant which is part of the hotel complex. This hotel was very nice. We had a suite consisting of a bedroom, living room with sofa bed for the kids, and kitchenette. The balcony was very large and overlooked the pool. We found the pools to be very cold and only swam there 1 or 2 days from our week. The pool bar was reasonable for drinks and snacks. The location was about 1-2 blocks from the beach. The satellite tv was quite nice, as we enjoyed relaxing with interesting programming in english. Had some difficulty with hotel payment. Initially, we thought we could pay with credit card. At check in the hotel said they did not accept credit cards, so we had to convert to cash. Then upon check out, hotel said that the rooms had already been pre-paid. There was a lot of confusion regarding the payment of the room, and I think we were overcharged due to the conversion of leva to GBP, when we are not from GB. There was also some difficulty getting to the bus station to get back to Sofia. There was no shuttle or taxi available. Taxis did not want to drive the short distance to the bus station, but we had quite a bit of baggage and it was difficult to carry. Those were the only disappointing items, every thing else was excellent.